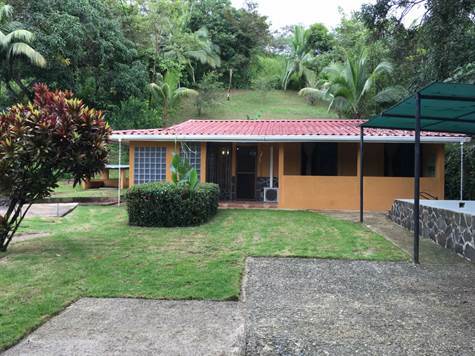 "Lots of Land, Privacy & Nature"
This affordable 3 bedroom home sits on a private and large tropically landscaped property. Ideally located in a quiet tranquil community only a few minutes from downtown Jaco, a Shopping Plaza & Los Suenos Marina and Golf resort. The home has a privacy wall to the street which makes you feel like you are in a nature retreat. This is a stunning property with views of the mountains rising up behind the home. Great for outdoor entertaining with BBQ, swimming pool and beautiful grounds. There's also plenty of space for your pets to run around. The home is surrounded by extensive covered porches and storage areas that allow for inexpensive expansion of the home's living areas. If you desire extra income- there's plenty of room to build cabinas to rent out and make money.